I know Christmas has come and gone and you’re probably wondering “why the heck is she blogging about Christmas in January?”…LOL! To put it plainly I was simply amiss in sharing these pretty cards I made last month so I’m just taking this opportunity to do some catch up. A little background…I’ve always loved crafts and making things by hand. Before I moved out of my parents house many years ago I always kept my room girlied (if that’s even a word..) up with pretty baskets and colorful ribbon hanging out of them and colorful fabric strewn across my bed whenever I was in the middle of a project. I crocheted blankets and made pillow covers and my own curtains. Then about twelve years ago a friend from work invited me over to her place for a scrapbooking party. Let me tell you…I had the BEST time and seriously got hooked and ended up spending a lot more than I wanted on things like colored patterned paper, punches, adhesives, stickers, dies, etc… The end result was a beautiful scrapbook album for my daughter that I worked on for weeks. To this day whenever I go through that album it just makes me smile. Now these days I hardly ever print the pictures I take. I don’t see the point when I can just easily share them on Facebook or Instagram for all my family and friends to see :-). But I’m still a paper craft nut and get my kicks by making handmade cards. I’m like a kid in a candy store when I shop at Michaels or Joanns, two of my favorite craft stores. I can just shop for hours but having the kids with me can be a bit of a blessing in disguise. They hate shopping these stores with me so they’re constantly rushing me and telling me to hurry up and pay so we can leave which often has kept me from filling the cart up till it’s full……LOL! I took white cardstock and cut it to about 4 1/2 x 6 inch in size so that it can fit onto the front of a 5 x 6 1/2 inch Kraft greeting card by Recollections allowing a border to be seen. I then used a snowflake stamp from the Snowman Christmas clear stamp set by Hero Arts and stamped randomly onto the white cardstock using a VersaMark watermark stamp pad. 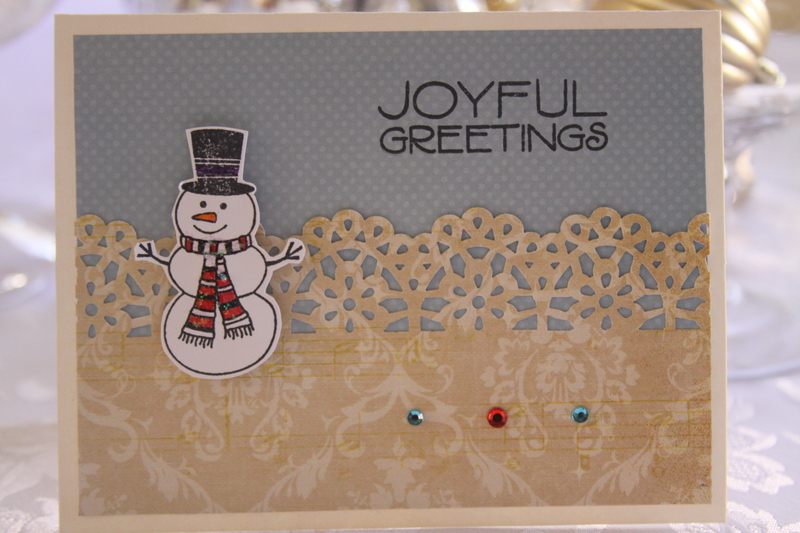 I sprinkled baby blue glitter embossing powder over the snowflake stamp and heated it with my embossing tool. You don’t want to overheat because it will cause the cardstock to warp. I then stamped the sleigh image from the Penguin Sleigh cling rubber stamp set by Stampendous onto another piece of white cardstock. After coloring in the image using my Le Plume marker set by Uchida and cutting out the image I added dots of Stickles gold glitter glue to the sleigh. In hindsight I think I could have colored in the sleigh some more to give it more pizzaz. I adhered the sleigh image onto the white cardstock using pop-up foam squares by Scotch to give it a 3-D effect. I also positioned the sleigh to make it look like it was going downhill…weeeeeee!!!! For the stamped sentiment I first used a circle template (purchased from Creative Memories many moons ago during my scrapbook craze) and cut out a 2 1/2 inch circle. I stamped the sentiment from the Snow Much Joy clear stamp set by Hero Arts in the center of the circle using Tuxedo Black Memento Ink by Tsukineko. I then cut out a slightly bigger circle on red cardstock to use as a mat for the stamped sentiment. The process was almost the same with this card. Instead of using Kraft I used the Ivory toned 5 x 6 1/2 inch greeting card by Recollections. I selected a light shade of blue patterned paper and trimmed it enough so that it can fit onto the front of the greeting card and still show a nice border around it. Next I used my Martha Stewart edge paper punch (not sure the name of this design since I’ve had it forever but I found the Martha Stewart Daisy Lace design on Amazon and it’s pretty dang close to the one I have ;-)). I found some pretty paper from my Heirloom Christmas cardstock collection from the DCWV. I took my edge punch to it and….well…you can see how cute it turned out. 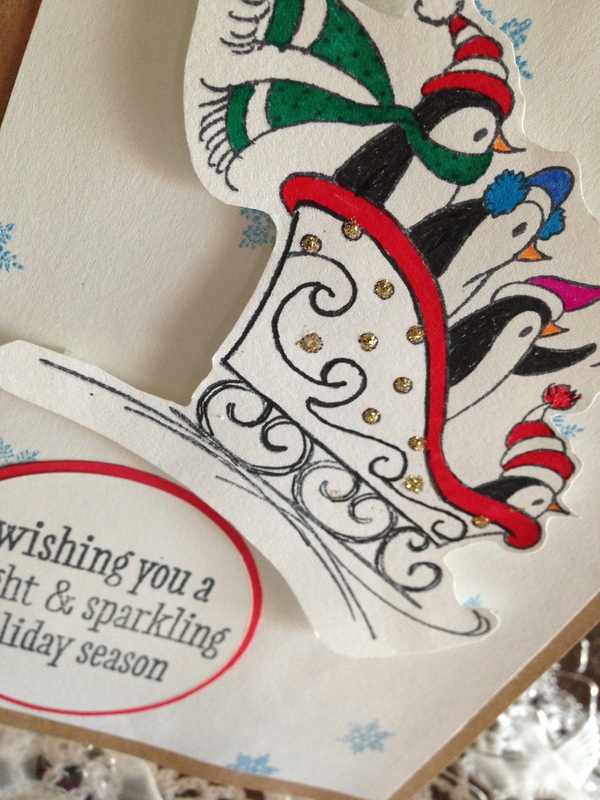 I adhered it to the card using Tombow Mono Adhesive Tape. I stamped a snowman from the Snowman Christmas clear stamp set by Hero Arts onto white cardstock, colored it in using my Le Plume markers by Uchida and then cut out the image leaving a white border around it. I adhered it to the pretty patterned paper with the nice flower edge using pop-up foam squares for that 3-D look. I stamped the sentiment (from the same clear stamp collection) onto the card using Tuxedo Black Memento Ink by Tsukineko. Final touch was adding adhesive rhinestones from K&Company. Walaa! 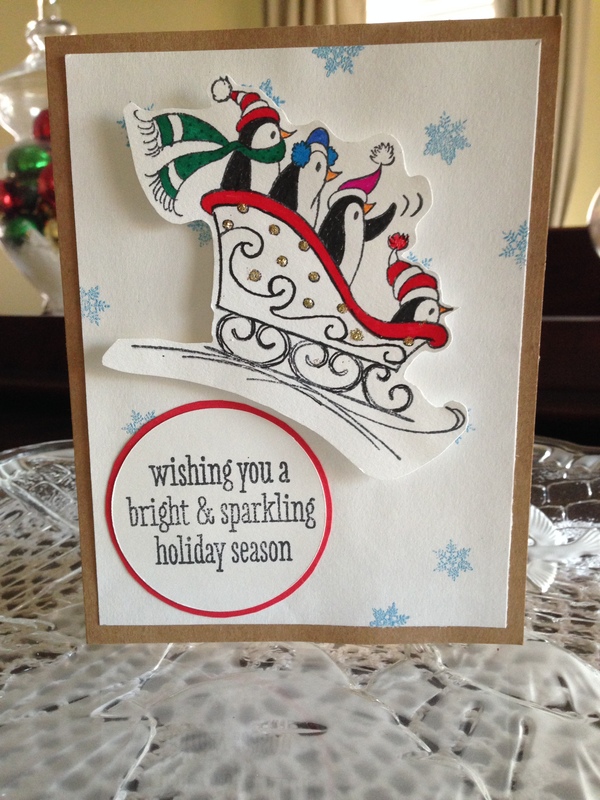 I think I could have embossed snowflakes onto this card too but honestly I was in such a hurry as we were heading out the door to a Christmas Eve party and needed to get these cards finished and dropped into their respective gift bags…LOL! This was quick and easy card to make. I used the Ivory toned 5 x 6 1/2 inch greeting card. 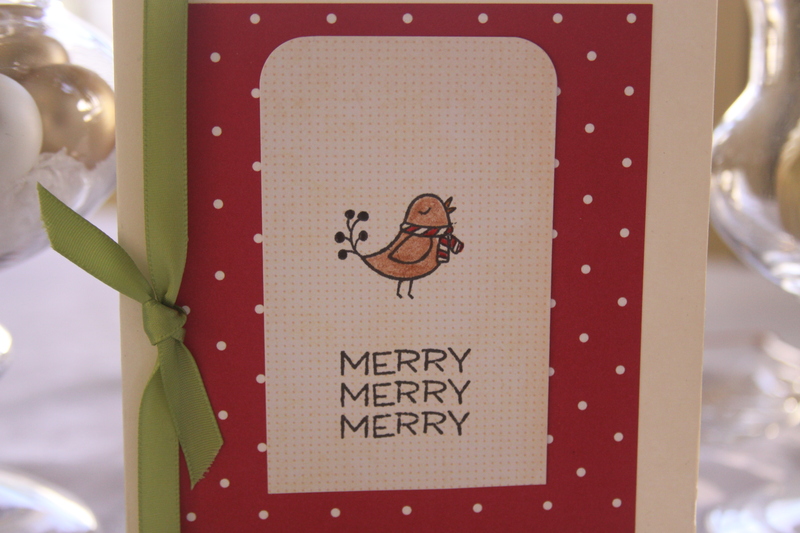 I selected a cute red polka dot patterned paper I found in my stash of scraps, trimmed it, then adhered it to the card. I found a scrap of patterned cream colored card stock, trimmed it, then adhered it to the red patterned paper. 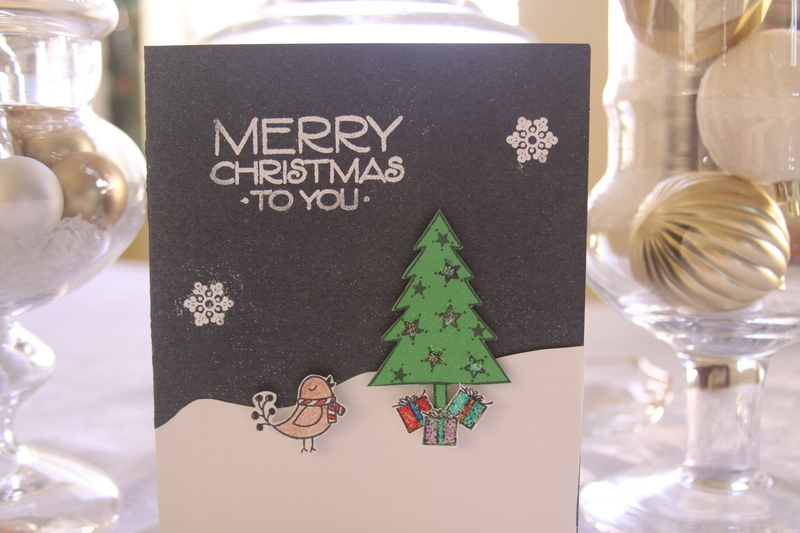 The Snowman Christmas clear stamp set by Hero Arts has the cutest little bird stamp. I stamped it directly onto the cream colored card stock and then colored it in using cheap colored pencils. Stamp sentiment is from the Holiday Sayings clear stamp set by Hero Arts. 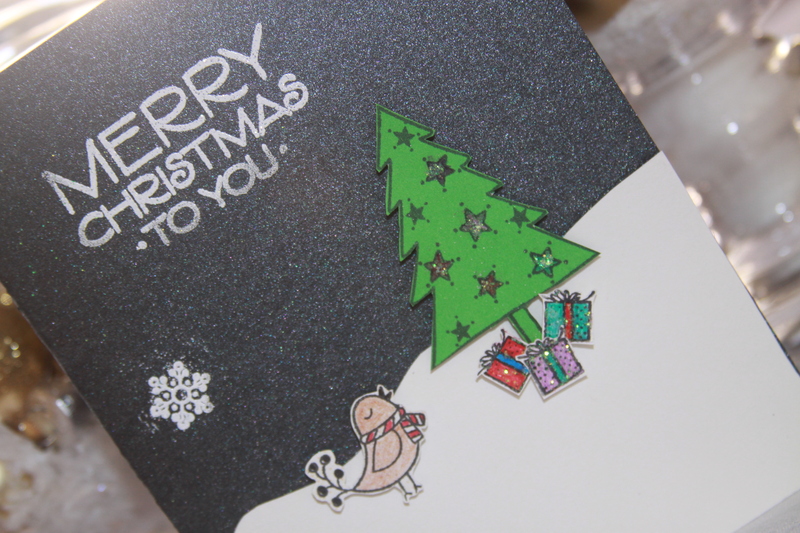 The sentiment was stamped onto the card using Tuxedo Black Memento Ink. Tied a green ribbon and done! Another quick easy card. 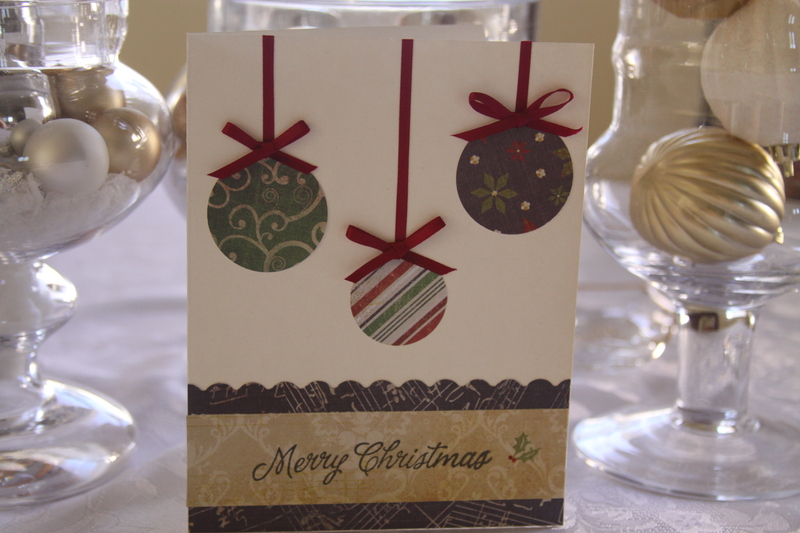 Used Ivory toned 5 x 6 1/2 inch greeting card then selected different patterned paper from my Heirloom Christmas cardstock collection by DCWV and punched out circles for the ornaments, adhered ribbon to the card to make it look like the ornaments are hanging. Using my scallop edge paper punch by Fiskars I punched out the edges of this music themed patterned cardstock from the Heirloom collection and adhered it to the card. I then cut out a strip of patterned cardstock from the same collection and adhered it over the music themed pattern then I stamped the sentiment from the Holiday Sayings clear stamp set by Hero Arts using Tuxedo Black Memento Ink. To finish off I stamped Christmas holly from the same stamp set using Bamboo Leaves Memento by Tsukineko. I colored in the red berries using a red marker from my Le Plume marker set. Last card. I cut out 6 x 10 1/2 black pearlized cardstock by Darice and folded it down to a 5 x 6 1/2 inch size greeting card. I had some white cardstock paper that I tore up to make it look like a blanket of snow and adhered it to the card. I repeated the embossing technique described under card #1 when stamping the snowflakes. I stamped a Christmas tree from the Snowman Christmas clear stamp set by Hero Arts onto green cardstock, colored in the stars using my Le Plume markers by Uchida. Then I used stickles clear glitter glue to fill in the stars again and then cut I out the image. I adhered it to the white snow using pop-up foam squares. I stamped the sentiment (from the same clear stamp collection) using a VersaMark watermark stamp pad onto the card and then repeated the embossing technique used in Card #1. Next I stamped a bird (from same stamp set) using Tuxedo Black Memento Ink, colored in the bird using colored pencils, cut out image and adhered it to the snow using foam pop-ups. Final touch was adding presents under the tree. The gift stamp came from the Holiday Sayings clear stamp set, colored in using Le Plume markers, cut out and adhered under the tree. Whew!!! 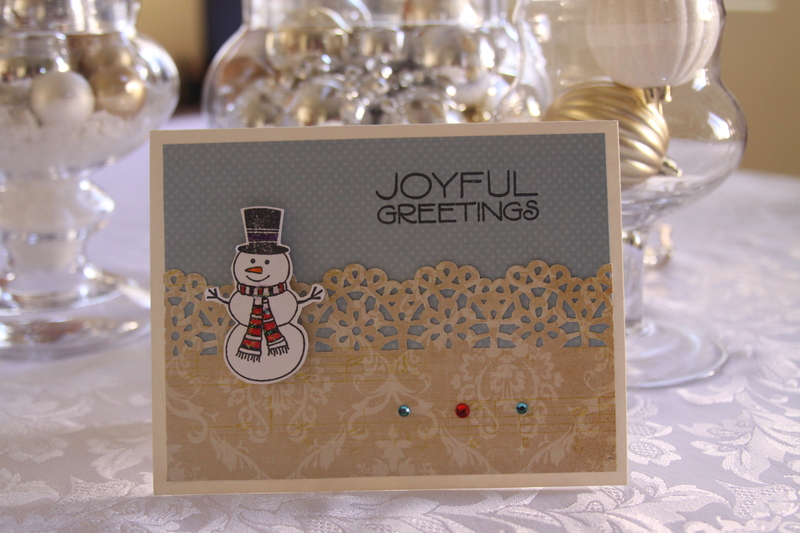 Maybe if I wasn’t so pressed for time when making these cards I would have thought to add more snowflakes….just saying…LOL!